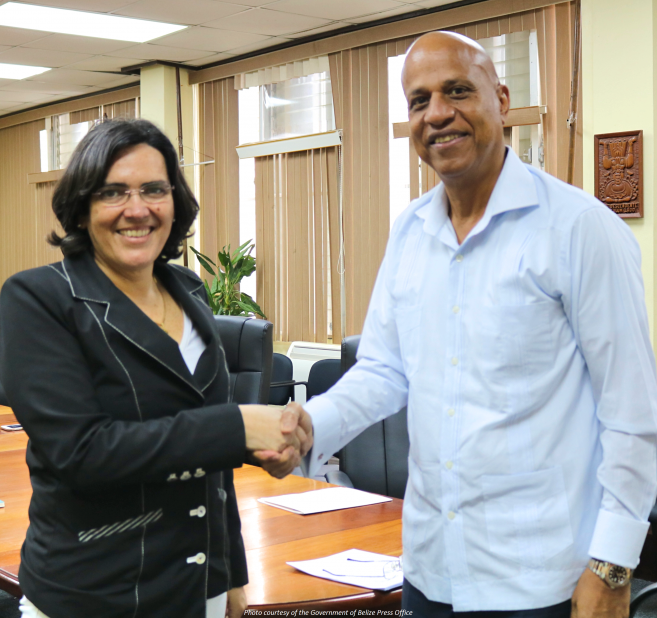 BELMOPAN, BELIZE – Verónica Zavala, General Manager of the Inter-American Development Bank’s (IDB) department for Central America, Mexico, Panama, Haiti and the Dominican Republic met with the Prime Minister of Belize, Rt. Hon. Dean Barrow on January 29 to discuss Belize’s relationship with the bank and programming for 2018. Among those attending the meeting were Cassandra T. Rogers, IDB Country Representative; Joseph Waight, Financial Secretary of the Ministry of Finance and Natural Resources; Yvonne Hyde, CEO of the Ministry of Economic Development, Petroleum, Investment, Trade and Commerce; and Elvira Méndez, Belize’s Representative on the IDB Board of Executive Directors. The IDB, a leading source of multilateral lending for Latin America and the Caribbean, has supported Belize since the country became a borrowing member in 1992. The Bank’s current portfolio in Belize includes five loans totaling US$72 million, supporting sustainable tourism, education, transport, solid waste management and climate resilience, as well as over US$17 million in technical assistance and investment grants. Several new projects are currently in preparation. The visit represents the first mission of Veronica Zavala to Belize in her capacity as regional manager for the IDB. advice, technical assistance and training to public and private clients throughout the region. Belize joined the IDB in 1992.